Here's the trick: You have to find him! We're giving you all the clues you need in order to track him down. So on your mark, get set, GO! In 1901 a favorite Boston sports team, known as the Somersets, began playing at the Huntington Avenue Grounds. In 1912 the team moved to this beloved Boston venue. Opened on April 20, 1912, this park is the oldest venue currently in use by a professional sports team in the United States. Located in the city of Boston, this venue includes many notable features, such as a lone red seat, Pesky’s Pole and the Triangle. The Green Monster is the nickname of the 37-foot-tall wall located in this famous park. The street we are on is named after the person who owned the Red Sox from 1933 until 1976. That's it! Last clue. Hope to see you out there. For a glimpse of what's in store for you and your family, click here and here to to see some of the lucky folks who managed to snap a picture with this celebrity penguin. 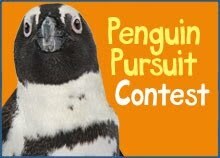 Earlier this month, sleuths followed clues to find this this famous New England Aquarium penguin right in the center of Faneuil Hall Marketplace, and later at the Children's Museum. Protected from the hot summer heat, he greeted visitors from inside a fully enclosed air-conditioned cart. He even brought a team of educators who were well equipped to answer any penguin question thrown at them. Good luck. See you later, Roast Beef will be waiting for you!